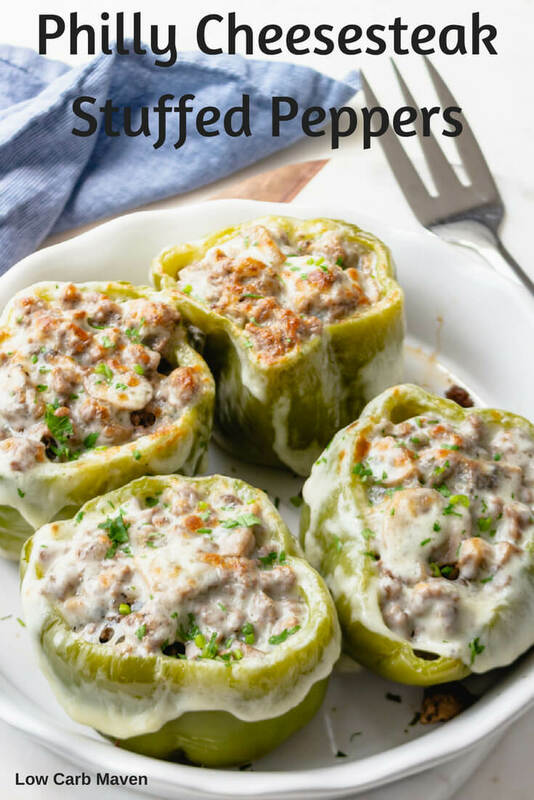 This easy recipe for Philly cheesesteak stuffed peppers is a low carb family favorite. 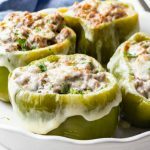 Ground beef keeps the stuffed peppers moist and delicious. Does your family love ground beef like mine does? 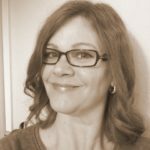 Mine can’t seem to get enough of ground beef recipes like low carb tacos, taco salads, and sloppy Joes. 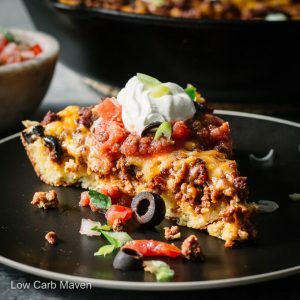 And low carb tamale pie makes them especially happy. 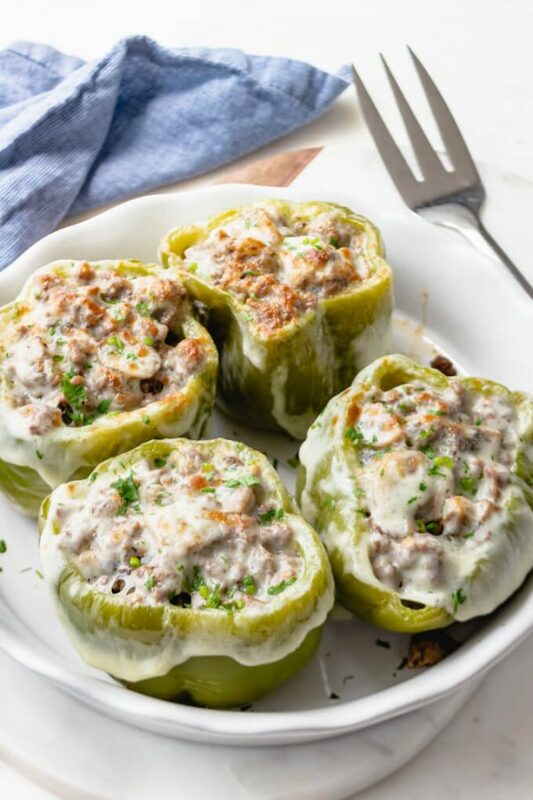 Here’s another tasty family meal – Philly Cheesesteak Stuffed Peppers! I hope you like it, too. Stuffed peppers is an easy weeknight meal and an old family favorite. Mom made her stuffed peppers the Italian way with rice and tomato sauce – so good! But, experimenting with new flavor combinations keeps things interesting. My family flipped for these Philly Cheesesteak stuffed peppers! 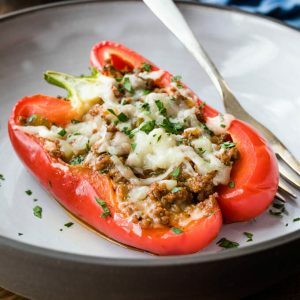 I tested the filling for this stuffed pepper recipe three ways: with thinly sliced roast beef, sliced steak, and ground beef. Here are my opinions. Stuffed peppers with roast beef: Thinly sliced leftover roast beef sautéed with mushrooms and onions was tasty and easy. I liked the texture of the roast beef, but it did get a little tough after cooking in the oven. I’m sure that deli roast beef would be just as tasty in this recipe. This was the fastest version of the three. 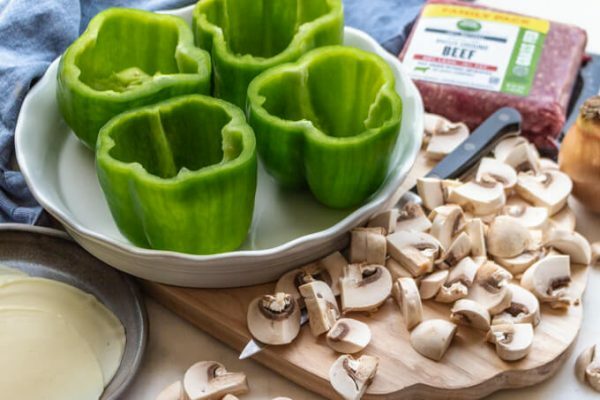 Stuffed peppers with sautéed steak: I sliced steak into strips about ¼ inch thick and 2 inches long and browned in a pan. Next, I sautéed mushrooms and onions, added the steak back to the pan and seasoned with. I stuffed the peppers with cheese and the beef mixture and baked. This tasty version resulted in more substantial pieces of meat in the pepper which was pleasing to the eye. Unfortunately, my kids had a little trouble cutting the meat with their forks. Stuffed peppers with ground beef: Lastly, I tested ground beef in the peppers. My family liked this version best. I browned the mushrooms and onions. Then, cooked the ground beef, added the mushrooms and onions back, and seasoned the mixture. Steaming the peppers in the microwave helped soften them and pouring out the accumulated liquid prevented sogginess. I placed one slice of provolone to the bottom of each pepper and stuffed them with the ground beef. The peppers baked for 20 minutes. Then, I topped each with a piece of cheese placed them under the broiler. 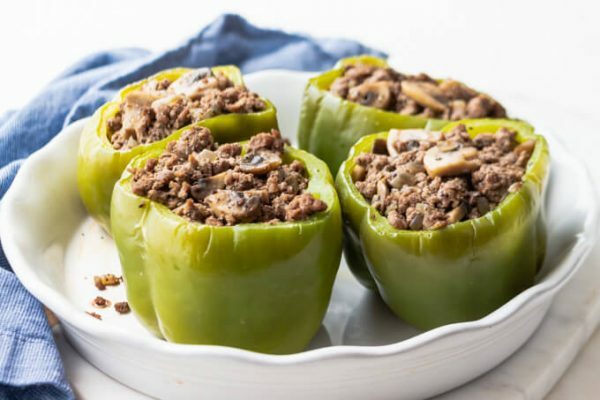 As I mentioned, my family preferred the Philly cheesesteak stuffed peppers with ground beef; perhaps this version was easier to eat or maybe the fat in the ground beef made them taste better. 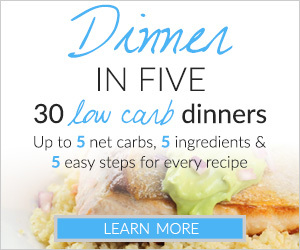 In any case, this is a no-brainer recipe that’s easy to prepare and doesn’t take much time. 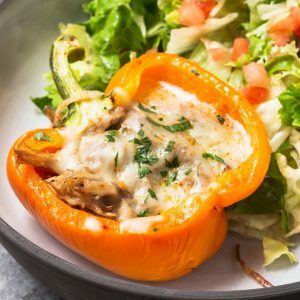 Each Philly Cheesesteak stuffed pepper is 7 net carbs per serving and a complete meal. Cut tops off of the peppers and remove remaining seeds pith. Place in a microwave safe baking dish, cover with cling film and cook for 3-4 minutes, depending on your microwave. Remove film and using tongs, pour out any accumulated water from the peppers. Meanwhile, heat a pan over medium heat. When hot, add oil and swirl to coat the pan. Stir in the mushrooms to coat in oil and let cook in a single layer for 2-3 minutes. Add the onion and stir, cooking until they turn translucent and the mushrooms have cooked (2-3 minutes more). Remove the mixture from the pan. Add the ground beef to the pan, breaking it up while cooking. When cooked through, add the mushroom mixture back to the pan and season with enough salt until it tastes good to you. Add a generous amount of pepper (1/4 teaspoon or more to your taste). Lightly season the peppers with salt and pepper. Place 1 slice of cheese in the bottom of each pepper and evenly divide the ground beef stuffing among them. Bake for 20 minutes. Top with the remaining cheese and pop under the broiler to melt and brown. Serves 4 as a meal with one pepper each. 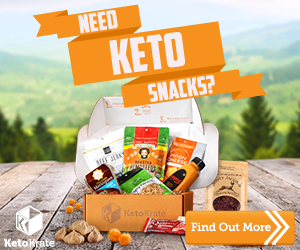 7 net carbs each. Love this recipe! Used a load of provolone, being a cheeseaholic, and it was amazing! I’m 17 and I made this for my dad and uncle. They haven’t tried it yet but I really hope they like it!! It turned out good and the recipe was super easy to follow! I love it!!! So good! 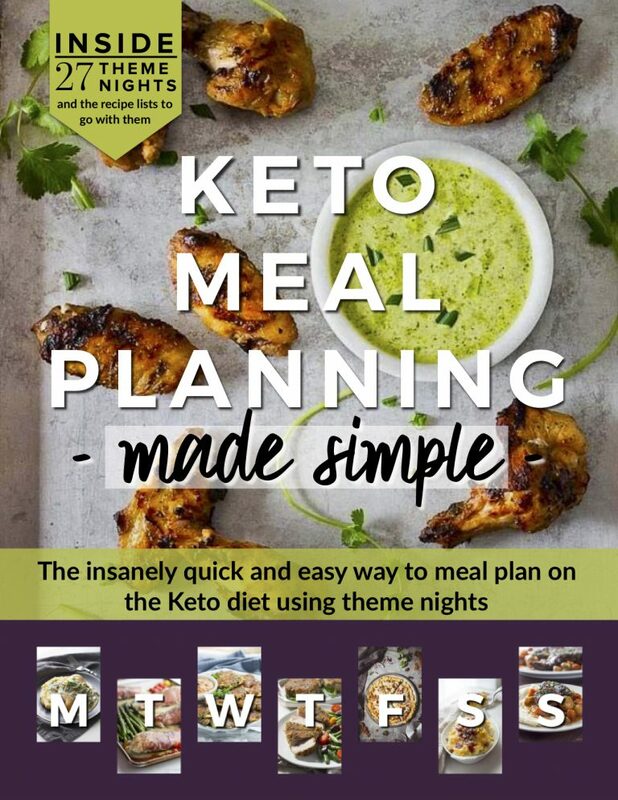 My husband is on a keto, I am not, but this was absolutely delicious. Like others I used minced garlic and added some red pepper flakes! My husband would probably like added pickled jalapeno! Thank you so much! WOW what a Great Recipe — Thanks! These were a HUGE hit! I used red and orange peppers for a little extra color. Also added a little garlic when adding the salt and pepper, YUM!